My name is Ogu, Okey Charles, IFAPA regional representative for Africa. Africa is a continent made up of countries located in west Africa, East Africa, North Africa and Southern Africa. West Africa is made up of eighteen (18) countries, East Africa ten (10) countries, North Africa seven (7) countries and Southern Africa ten (10) countries. Africa region is quite a large continent though economically challenged. I joined IFAPA in 2009 and since then have been passionate about their activities and issues related to Adapted Physical Activity; attending conferences within and outside the region. I have made personal efforts in mentoring young academics in adapted physical activity giving the fact that it is still at the infancy stage. Some of those l mentored have grown to become disability activists joining me in visiting rehabilitation centers for individuals with disabilities. I have formed a research consortium on Adapted Physical Activity. The main aim of the consortium is to promote research in adapted physical activity. In recent times the consortium had embarked on researches on adapted physical activity. One of the concluded research had been accepted for publication in the Illinois Journal for Health, Physical Education, Recreation and Dance since February, 2015. Presently, I am working closely with Martin Block to get two of our researches i.e. ; self- efficacy in APA and inclusion in Physical Education published in PALAESTRA. The region may not be so strong in the area of research because research trends in adapted physical activity quarterly from 2004 to 2013, a documentary analysis showed that only one article on APA in Africa was published . This may be attributed to limited access to resources and limited support for scholarship to pursue publication. This trend may likely be reverted as there appear to be prospects for APA in Africa in future. It has been drawn to my attention that University of Uyo, Nigeria is presently offering courses in adapted physical education at the post graduate level. However, I am not aware of any university in African region running an undergraduate programme in adapted physical education. This is an area I think the region needs collaboration. Universities in Africa will be willing to partner with any country in APE/APA. 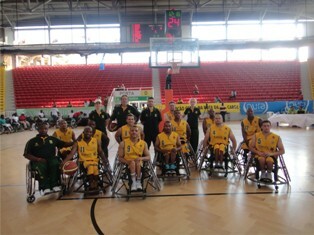 There has been positive outcomes in Paralympic sports in Africa. People with disabilities in the region have participated in Paralympic sports competitions at the regional and international levels. Various governments in Africa focus more attention in Paralympic sports than in development of many diverse areas of the discipline of Adapted Physical Activity. This is an area that requires more attention.